Yossi Milo Gallery is pleased to announce an exhibition of color photographs by Pieter Hugo, entitled Permanent Error . The exhibition will open on Thursday, September 8, and close on Saturday, October 29, with an opening reception for the artist and book signing on Thursday, September 8, from 6:00 to 8:00 pm. This is the artist’s third solo exhibition at the gallery. 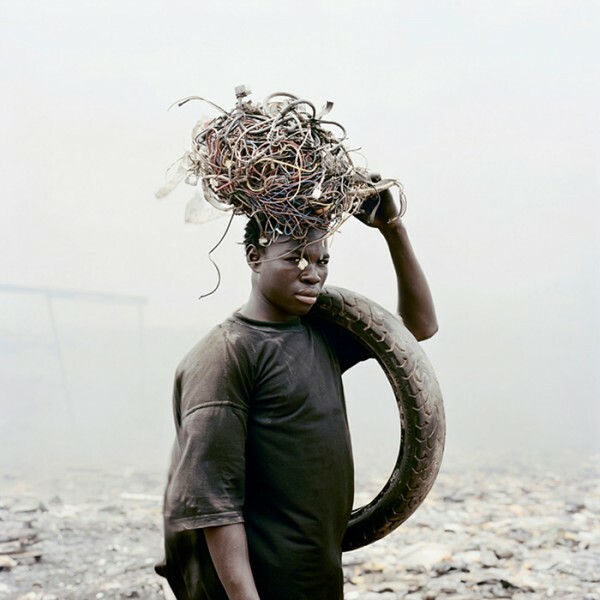 Pieter Hugo’s new series, Permanent Error , depicts Agbogbloshie, a massive dump site for technological waste on the outskirts of Ghana’s capital city, and the locals who burn down the components to extract bits of copper, brass, aluminum and zinc for resale. Tons of outdated and broken computers, computer games, mobile phones and other e-waste are shipped to the area as “donations” from the West, under the guise of providing technology to developing countries. Rather than helping to bridge the digital divide, the equipment is transformed into noxious trash threatening the health of the area’s inhabitants and contaminating the water and soil. Gray plumes of smoke rise from smoldering piles of disassembled monitors, motherboards and wiring, providing an apocalyptic backdrop for Hugo’s portraits of the workers. The subjects, many of whom are young men sent by their families from impoverished outlying villages, are photographed full-figure and directly engaged with Hugo’s medium-format camera. With each portrait, Hugo draws the viewer into the conditions imposed on this slum community and their effects on individuals. Collectively, the photographs expose consequences of the West’s consumption of ever-new technology and its disposal of outmoded products in poor countries ill-equipped to recycle them. Pieter Hugo’s work was recently on view at the Victoria & Albert Museum in London; the Institute of Modern Art in Brisbane, Australia; and the Kiasma Museum of Contemporary Art in Helsinki, Finland. A mid-career retrospective exhibition curated by Wim van Sinderen will open in February 2012 at The Hague Museum of Photography, The Netherlands, and will travel through 2014. Mr. Hugo received the 2008 Discovery Award at the Rencontres d'Arles Festival and the 2008 KLM Paul Hauf Award. His work is held in the permanent collections of the J. Paul Getty Museum, Los Angeles; Metropolitan Museum of Art, New York; San Francisco Museum of Modern Art; Musée de l'Elysée, Lausanne; Huis Marseille, Amsterdam; and the Victoria & Albert Museum, London, among others. The artist’s previous books, The Hyena & Other Men (2007) and Nollywood (2009) were published by Prestel, which released Permanent Error in March 2011. Pieter Hugo was born in South Africa in 1976 and currently lives and works near Cape Town.